Mariners GM Jerry Dipoto and director of player development Andy McKay had plenty to say about the team's farm system being rated 30th out of 30 teams by Baseball America. What do others think as well? Andy McKay knew the question was going to be asked. And as the Mariners’ director of player development, he was obviously prepared to answer it. His boss, general manager Jerry Dipoto, was so ready to discuss the topic that he didn’t even wait for the question to be asked, instead starting off his media session in Thursday’s pre-Spring Training luncheon with a lengthy statement about it. The news that the Mariners’ farm system had been rated as the worst of the 30 teams in MLB by Baseball America — a leading publication about the subject — was not something to that could be shrugged of despite how much McKay and Dipoto disagreed with the assessment. Later that day, Keith Law, ESPN’s prospect guru, also ranked the Mariners as the worst farm system in baseball. The news was just another troublesome reminder to displease Mariners fans, who have grown frustrated with the team’s lack of progress on the field at the big league level and worry it may not be improving. But should it be that anger-inducing for fans? Probably not. It’s one measure of a system but not a definition of it. So what information does he care about? Dipoto stood in the back of the conference room at Safeco Field as McKay discussed the farm system. He took the dais when McKay was done and opened with a statement instead of waiting for the inevitable question. Well, okay then. But Dipoto wasn’t even close to being finished. “To that note, it’s really hard to move forward in the ranking system when a couple of things hit the, I guess, hit at the same time. One of those being we have traded prospects which affects our depth. We have traded prospects for players in some cases who are playing at the top end of our system, and in some cases are on our big league club. I’ll get to that in a minute. We have also suffered injuries to maybe our profile players, our top four prospects by Baseball America’s rankings, and frankly probably internally. Guys like Kyle Lewis, Evan White, Sam Carlson, and Julio Rodriguez. One has never played in a professional game and the other three had seasons that were cut short. That’s a lot of productivity from a farm system in two years, so it’s all perspective. It’s how you choose to look at what your farm system is doing. And along the way we still have a considerable number of players that we’re quite happy we have. We will continue to look for ways to be younger, to get more cost effective and more efficient in how we re-deploy our innings pitched, our plate appearances. It also goes, and hopefully without saying, that you’re not going to make too many advances in prospect rankings when you graduate 475 innings pitched in the big leagues, which is what our rookies did last year, 250 games pitched which is what our rookies did last year, 1,522 plate appearances. That is the most innings pitched by rookies, the most games pitched by rookies, and the second most plate appearances taken by rookies in the American League. It’s the most in each one of those categories in the history of the Mariners. So that’s a lot to digest. In fairness to the Mariners, how the prospect rankings are calculated is a factor in their being 30th. Because Andrew Moore, who is still a prospect by most definitions, pitched more than 50 innings at the big league level in 2017, he doesn’t qualify for the list, neither does reliever Dan Altavilla nor outfielders Guillermo Heredia, Mitch Haniger and Ben Gamel. The achievement of prospects making the big leagues and staying there actually works against a team’s prospect rankings. Also the farm system rankings wisely don’t take into consideration team wins from the affiliates — something that McKay believes is essential to development. So while Class A Modesto won the Cal League that has no influence on the farm system rankings. Even with those qualifiers, the system still isn’t good in many aspects. The Mariners’ projected lineup features Gamel, Haniger and Dee Gordon in the outfield, Jean Segura at shortstop and Ryon Healy at first base, the bullpen features David Phelps, Nick Vincent and James Pazos and the rotation has starters Mike Leake and Marco Gonzales — all of those players were acquired in trades where the Seattle gave up players that were drafted and developed in its system. So in Dipoto’s mind, his farm system produced those players on the big league roster in a non-traditional way, which he pointed out also isn’t part of the rankings. The trades have made the Mariners projected 25-man and 40-man rosters to be much younger than two years ago with many players under club control. 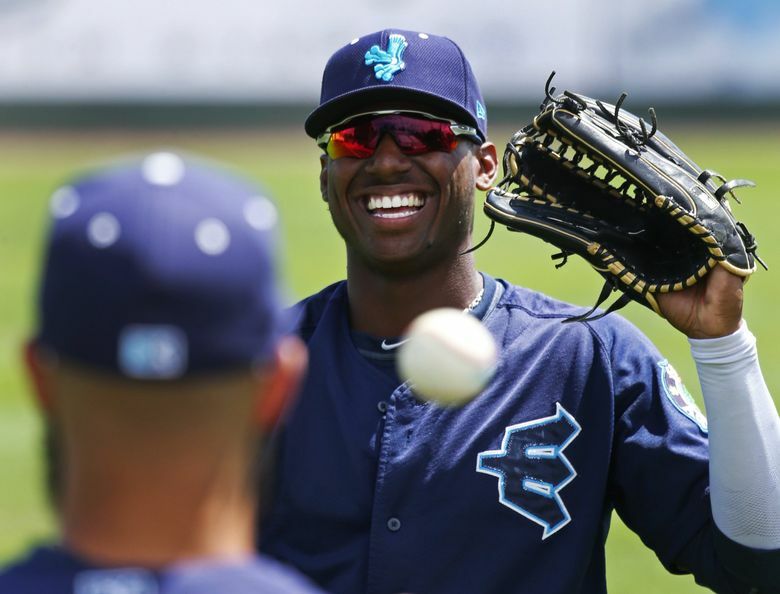 Having Gamel, Haniger, Heredia, Healy, Mike Zunino, Edwin Diaz, James Paxton and Gonzales part of the future going forward might no necessitate having a ton of MLB-ready prospects waiting for a chance at Class AAA. Glaser admitted the Mariners weren’t going to be destined for the No. 30th spot at the start of the offseason. But when the Mariners gave up top pitching prospect Nick Neidert, infielders Chris Torres and Alexander Campos and pitcher Robert Dugger in deals for Healy and Gordon, they moved down to the lowest spot. Still, it’s easy to see why a system and the outlet ranking the system can find things disagree upon. What about outside observers? Two scouts from different big league teams were contacted and asked about the Mariners’ farm system and its ranking. The National League scout wasn’t quite as critical. Both scouts understood how the Mariners pursuit of a better big league roster is a factor. The lack of starting pitching prospects was the consensus weakness of the system. Sam Carlson, who was a second round pick in 2016, is considered the top starting pitching prospect in the system. He made just two appearances in the Arizona Rookie League last season before being shut down with elbow issues. “Their pitching seems weakest overall outside of some of the 2017 draft profiles,” said the NL scout. The Mariners have traded a fair amount of starting pitching away. The most talented of the group was lefty Luiz Gohara, who was traded to the Braves as part of the series of moves to get Drew Smyly. Gohara, 21, has a mid 90s fastball and plenty of talent. He was signed by the Mariners out of Brazil at age 16. Questions about his attitude, work ethic and other off the field issues dogged him during his time in the Mariners system. When his value seemed to have peaked after a solid 2016 season and a good showing in the Arizona Fall League, the Mariners moved him for what they believed was a consistent No. 3 starter in Smyly. It was a logical for a team with legitimate postseason hopes. But Smyly got hurt and never pitched, while Gohara seemed to have a wake-up call after being traded. He made his big league debut in September, starting five games and will compete for a rotation spot this spring. There are more names that have been moved with varying levels of talent: Neidert, right-handers Freddy Peralta, Zack Littell, Brandon Miller, Juan Then, Juan De Paula, Enyel De Los Santos and lefty Ryan Yarbrough. Not all will be good or even make the big leagues, but their absence has affected Seattle’s overall depth. The current ranking isn’t indicative of future success or failure. The Mariners had the No. 2 farm system in 2014 by Baseball America. And that didn’t produce a postseason appearance in the years to come. There is one thing that could make it forgettable — winning. December 7, 2017 — Acquired 2B Dee Gordon and international signing bonus pool money from Miami for RHPs Robert Dugger and Nick Neidert and INF Christopher Torres. December 6, 2017 — Acquired international slot money from Minnesota for C David Banuelos. November 16, 2017 –– Traded RHP Thyago Vieira to the Chicago White Sox for international signing bonus pool money. November 15, 2017 — Acquired INF Ryon Healy from Oakland for RHP Emilio Pagan and SS Alexander Campos. August 20, 2017 — Acquired RHP Mike Leake and Future Considerations from the Cardinals for SS Rayder Ascanio. July 21, 2017 — Acquired LHP Marco Gonzales from the Cardinals for RF Tyler O’Neill. July 20, 2017 — Acquired RHP David Phelps from Miami for OF Brayan Hernandez and RHPs Pablo Lopez, Brandon Miller and Lukas Schiraldi. March 1, 2017 — Acquired RHP Chase De Jong from the Dodgers for RHP Aneurys Zabala and SS Drew Jackson. January 11, 2017 — Acquired LHP Drew Smyly tfrom the Rays for SS Carlos Vargas, CF Mallex Smith and LHP Ryan Yarbrough. January 11, 2017 — Acquired CF Mallex Smith and RHP Shae Simmons tfrom the Braves for LHP Luiz Gohara and LHP Thomas Burrows. November 28, 2016 — Acquired RHP Max Povse and RHP Rob Whalen from Braves for RF Alex Jackson and Player To Be Named Later. November 23, 2016 — Acquired SS Jean Segura, CF Mitch Haniger and LHP Zac Curtis from Airzona for SS Ketel Marte and RHP Taijuan Walker. November 18, 2016 — Acquired 3B Richie Shaffer and SS Taylor Motter from Rays for RHP Andrew Kittredge, 1B Dalton Kelly and RHP Dylan Thompson. November 18, 2016 — Acquired LHP James Pazos from the Yankees for RHP Zack Littell. November 11, 2016 — Acquired 1B Danny Valencia from the A’s RHP Paul Blackburn. August 31, 2016 — Acquired RF Ben Gamel from the Yankees for RHP Jio Orozco and RHP Juan De Paula. June 19, 2016 — Acquired RHP Zach Lee from the Dodgers for SS Chris Taylor. November 12, 2015 — Acquired RHP Joaquin Benoit from the Padres for RHP Enyel De Los Santos and SS Nelson Ward.